In a small bowl, dissolve the yeast and sugar in 1/2 cup warm water. In a large bowl, mix remaining 3 1/2 cups warm water, honey, molasses, oil, eggs and lemon juice. Mix well. Add yeast mixture and stir. Gradually add 5 cups whole wheat flour beating well after each addition. Add the flax, cracked wheat and sunflower seeds, stir well. Let stand for 20 minutes, until mixture is very light. Stir in salt and the rest of the flours until dough pulls away from the sides of the bowl. Knead 10 to 15 minutes until dough is smooth and elastic. Put into a greased bowl and cover, let rise in the oven with light on until doubled, about 1 hour. Punch down and shape into 6 round balls. Cover and let rest for 20 minutes. Form into loaves and let rise covered in oven until doubled. Bake at 375 degrees F (190 degrees C) 25-35 minutes. 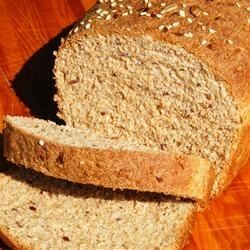 This is simply the best bread I have ever made! Thank you for this recipe! I am opening a B&B and this is the third day in a row I have made up this delicious batch of bread! MMmmm.